The year is 2015 and the world is getting its first taste of super-powered individuals making their presence known all around the globe. Danger and conspiracy lurk around every corner, be it from government agencies looking for the secret to these power or other AMPs looking to battle in a show of supremacy. 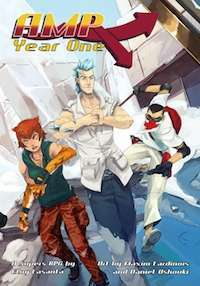 AMP: Year One is an RPG that puts this first year under a microscope, presented as a timeline of events that escalate to its boiling point. Players become AMPs (people with Accelerated Mutant Potential), as is their birthright, but dealing with their power isn’t always what it’s cracked up to be. Powered by the new DGS-Combo system, every roll of the die is packed with excitement. Players can use the easy-to-learn rules to create their own AMP and pick from over 50 unique powers or choose one of more than 20 pregenerated AMPs and jump right into the action. I have a question about combat, using the skill combo system would you roll fighting+might or just fighting+half skill again? I ask because with behemoth characters, they can end up rolling something along the lines of 4 fighting +22 might from various bonuses which seems a bit high and almost impossible for normal people to avoid. Well, remember that initiating the grapple and thengeapple maneuvers are two different things. Might isn’t the skill to initiate a grapple. That’s more Fighting + Speed or possibly a Fighting x1.5, depending on what circumstances occur. Might comes into play as soon as they are in a grapple and Behemoth makes them really dangerous in that case. I have a question about punching damage. I have a character with str 6, Athl 5. He has 5 fighting and the giant trait and Bodybuilder 4. How much damage would a standard punch do? The group has been having some difficulty fleshing out unarmed close combat damage. If I've read it right that would be 2 base + 1 from bb+ 1 from giant+ any boost. Is that correct? Also what is strength bonus used for? How does AMP handle combat damage? Is it a hit points-like system? Roll dice for damage or fixed damage values? Or is it some kind of abstract damage system like in Mutants & Masterminds? Characters have hit points, called Integrity. Damage itself is dependent upon how you attack and what you attack with, but is generally static. If you attack the same way over and over, it'll deal the same amount of damage each time. How compatible for play are the various DGS games (Ninja Crusade, AMP, API, and PTG)? Are they designed to work together in the same way that the White Wolf universe was? Unlike White Wolf's games which are assumed to take place in the same universe, Third Eye Games' gamelines are each distinct worlds and settings. They are mechanically diverse, though they do use the same core system. Using them together would take a little working but is could be possible. Strangely enough, the only review available for this product manages, over several paragraphs, to avoid a single detail by which an informed decision might be made. How does this game get a rating of 5 stars, when there's no review??? It's been in place for a awhile on DTRPG, but you can rate a game without leaving a written review. I'd prefer people leave a written review to share their experience, but ratings are welcome as well.